These are amazingly delicious. 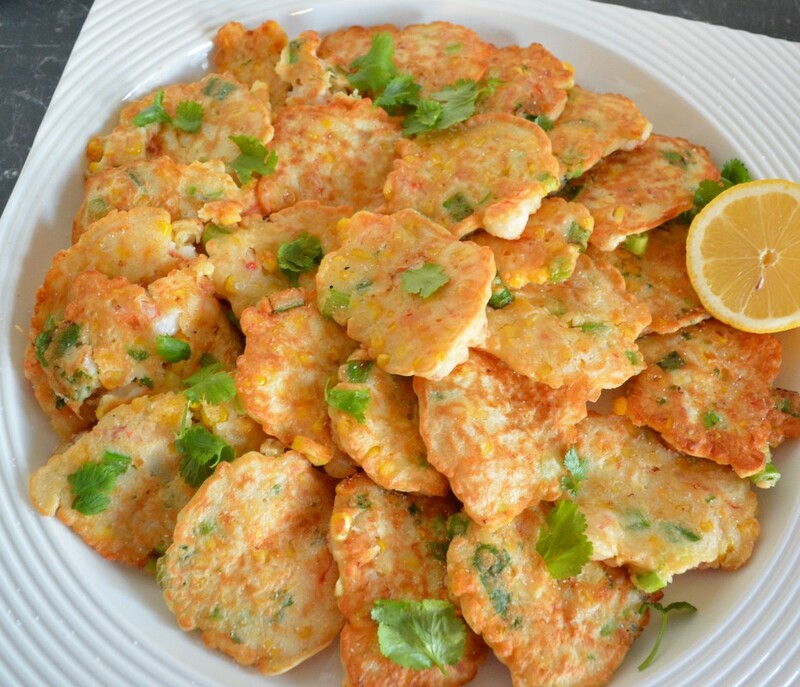 They are so simple to make, and a true crowd pleaser. Years ago I started making these after watching Lyndey Milan make them on Fresh-a TV show I loved. And they continue to make an appearance at parties I have, whether it be a kids birthday party or an adult dinner party. They are great to have as people arrive, with drinks. It can also be a light dinner with a fresh salad on the side. 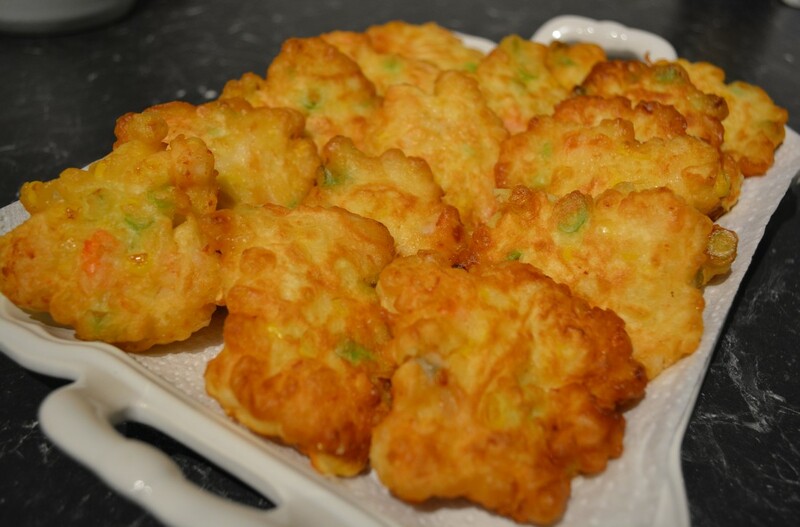 They are also great as they can be made several hours earlier, and reheated before serving. I like to coarsely chop the prawns, so you get a proper bite of it. But that is up to you how you want it. 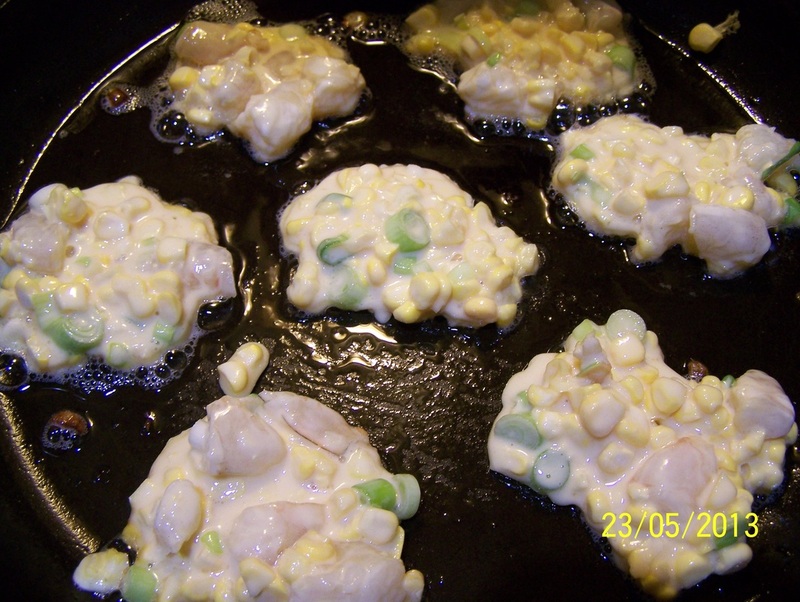 I don't use frozen corn as it would splatter too much when cooked, however, I quite like to use frozen Australian uncooked prawns, that have been defrosted before using them. The recipe can be confidently doubled if you need more. Recipe adapted from Lyndey Milan. Slice the corn from the cobs. You will need 1 1/2 cups of corn for the recipe. In a large mixing bowl, add the flours, salt and sugar. Add the eggs and then gradually the milk, whisking after each addition, so you remove all the lumps from the mix. Keep whisking until smooth. Add in the corn, prawns, green onions, and coriander (if using). Stir well to combine. Heat a large non stick frying pan over low heat. Add half the oil, it should cover the base of the frying pan. Using a soup or dessert spoon, carefully drop 1 spoon of the prawn and corn mix into the hot oil. If you want larger 'cakes' drop in 2 spoons of the mix. Cook over low heat until browned on the base. (They are cooked over a low heat to ensure the don't over brown on the outside, while still being raw on the inside). When browned on the underside, carefully flip over, and continue until browned and cooked through. Repeat with remaining oil and prawn and corn mix. Serve with a salad of you choice. As mentioned earlier these can be made ahead of time, and reheated just before serving. The photo below is the amount you get by doubling the recipe.